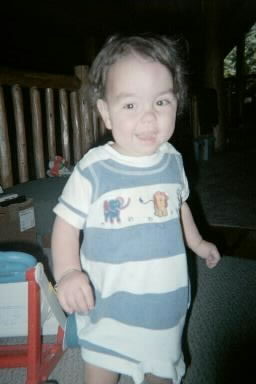 Aidan was born on June 2nd, 1999. He spent the first two weeks of his life at Clovis Community Hospital with what they thought was an infection. He then got to go to his home in Shaver Lake for one week before having to be hospitalized again at Valley Children's Hospital in Fresno. They ran tests and discovered that he may need a liver transplant and prepared to send him to the hospital at UCSF in San Francisco. 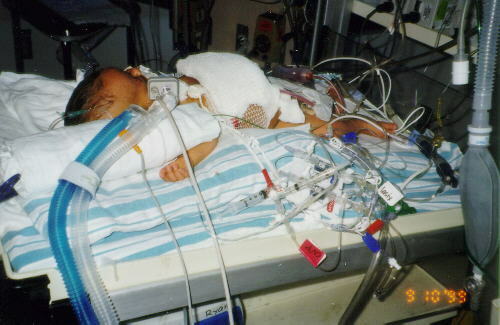 On July 1st in the early morning hours he started to have problems and they transferred him to the intensive care unit. During the transfer from the 1st floor to the 3rd floor he 'crashed' and his heart stopped. After 4 1/2 minutes they were able to get his heart going again. He was taken to UCSF by ambulance and his Mom and Dad followed the ambulance in their car. 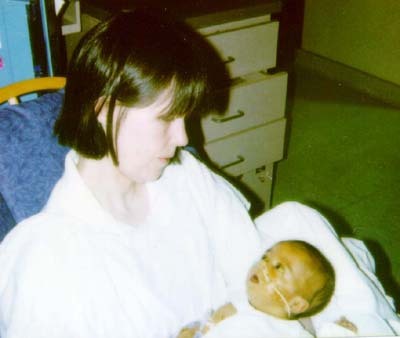 At UCSF the doctors discovered he had neonatal hemochromatosis which is an overload of iron which had pretty much destroyed most of his liver. The mortality rate from this is 88%. 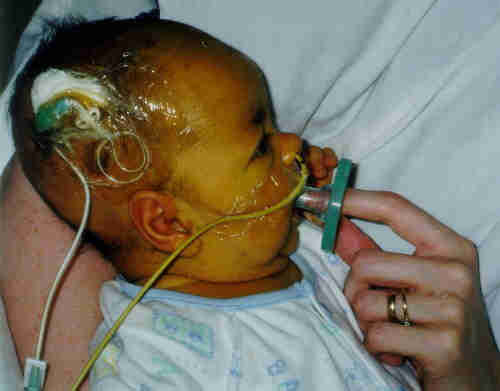 He also had ARDS (Adult Respiratory Distress Syndrome) and babies really don't survive this. Especially ones that where in as bad as shape as Aidan was. He had to go on a special respirator. This was a very difficult time filled with lots of prayer. The Ronald McDonald House of San Francisco had a room for us to stay at, which was very helpful. He spent most of July on the respirator, but he survived and got off the respirator before the end of the month. 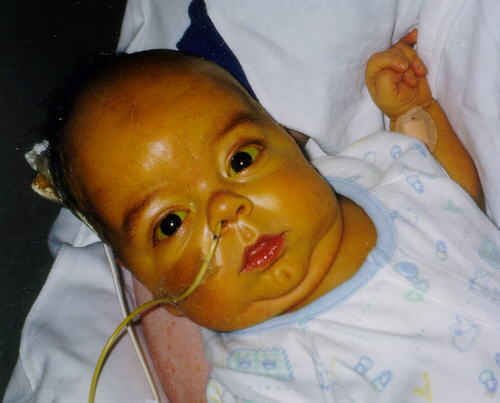 He was too tiny for them to do a transplant so he needed to grow, but they weren't sure he would be able to because his liver was not in very good shape. It took a long time with setbacks, but he did gain weight and he had his liver transplant starting at about 8 PM on September 30th and finishing at about 8 am on October 1st. 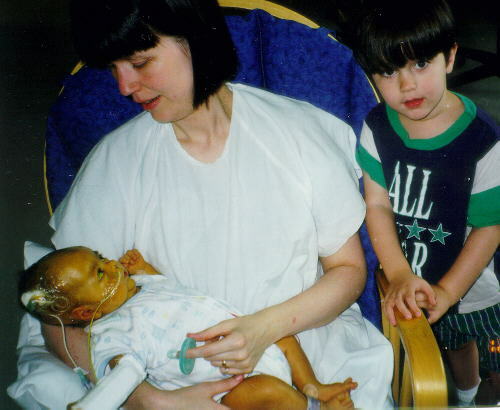 This was a very scary time because just before the transplant operation, Aidan's heart stopped again. They got it going again, but said that the surgery would be very risky. There are some very special people on the liver transplant team, on the 15th floor NICU, 7th floor PICU, 6th floor PICU, and regular 6th floor rooms at UCSF. There are all Aidan's friends and we love them. 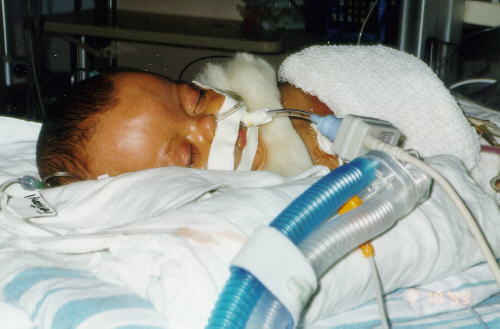 This is not long after Aidan was born when he was still at Clovis Community Hospital in June. Aidan with Mom near the start of Sept. He's very yellow and still needs to gain weight. This is mid-September. 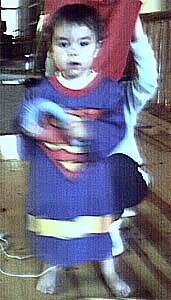 Aidan had lots of problems losing IVs so they ended up threading a line from a vein in his head down into his heart. The tube in his nose is a NG and it goes into his stomach to give him special formula. Aidan's brother Kieron visited with him a lot. This is mid-September, before Aidan had to go back on the oxygen. Even the whites of his eyes were yellow. This is September 30th just before he went off for his transplant operation. His whole family got to come in a visit with him before the operation. This is still September 30th and Aidan's family is visiting him. He was retaining lots of fluid and wasn't very comfortable at all. About 10 minutes after this photo was taken Aidan's heart stopped again and his great doctors and nurses got it going again. And then he went off to surgery while his family waited and prayed. This is 9 days after the surgery on Oct. 9th. After the liver transplant, the doctors had to go in for 3 more follow up surgeries because of internal bleeding. He was doing much better at this point and his color was starting to get better. He was still on the respirator and had a lot of medications going into him at this point. Here's a close up of him on Oct. 9th resting while the respirator breathes for him. His liver is working great and his color is starting to return to normal. Aidan got to go home from the hospital to an apartment in San Francisco on Oct. 28th, but he had problems and had to return to the hospital on October 31st. He had fluid pressure building in his brain and they had to put in a external shunt which is a tube into the brain that lets the fluid drain out and relieve the pressure. His head had to be kept level so he was confined to bed unable to move again. At this point in mid-November he had a stroke and also either a fungal infection growing in his brain or else bleeding in the brain. His whole left side was completely limp and he didn't wake up for a couple of days. They started him on 28 day course of a powerful anti-fungal medication that they called "ampo-terrible" because of the side effects. The neurosurgeons put a permanent shunt draining from his brain down into his abdomen in late November. This first attempt didn't work and the pressure started to build in his brain again. The neurosurgeons went back in a second time with the liver transplant team near the start of December for a second attempt to place the shunt in a different position in his abdomen. The thought the first attempt had failed because all of the scarring in his abdomen was keeping the brain fluid from being absorbed. This second attempt worked and Aidan was released from the hospital to an apartment in San Francisco again. All his aunts, uncles, cousins, and grandparents came to San Francisco to celebrate Christmas with him. It was very special for us. Aidan had to spend the New Year back in the hospital because he got sick again. He had four hospital stays in January because of various problems and two stays in February. On February 11th Aidan got to go all the way home to Shaver Lake. It was the first time he had been home since his 1 week stay after he was born in June. Near the start of March Aidan got a fever and went down to Valley Children's Hospital in Fresno for tests. He was only there for about 5 hours before had to drive over with his whole family to the hospital in San Francisco. He had an infection of his bile ducts and also a blockage of his bile duct that would need surgery to fix. He spent the month of March in the hospital going through a few surgeries. As of today (April 26th), Aidan has been home again in Shaver Lake for two weeks and appears to be doing very well. A doctor at UCSF said that he is a true medical miracle. Aidan had many people praying for him all over the world. Aidan is home! Thank you God! Than you Jesus for keeping your sheltering hand over us and carrying us through this difficult time!! Please say a prayer for the donor family that Aidan got his liver from. They gave us back our little baby. All we know of them is that the liver came from a little child from somewhere in central California. Aidan is feeling better now and he's not yellow! Hanging out with Dad is fun. 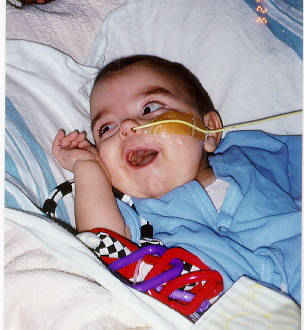 Aidan had surgery in June 2000 to fix his hernia and also to put in a g-tube for feeding. He won't eat by mouth yet. This surgery was fairly minor and he was out of the hospital within a few days. 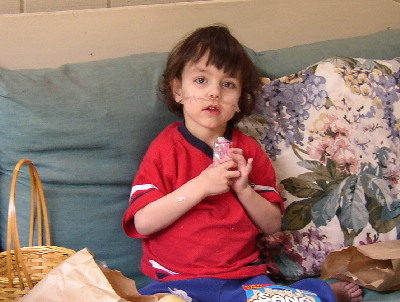 Aidan has ended up needing another fairly big surgery in August 2000 to repair his bile ducts. His liver function tests have been abnormal for quite a while and UCSF was worried about rejection. A liver biopsy showed that no rejection was occurring, but his bile ducts had a blockage that needed to be fixed. They opened him up again and were able to get the problem fixed. After another stay of just under a month in San Francisco, he is back home again and happy. Aidan is doing much better, but the effects of his stroke are showing up. He has finally started to walk, but he really teeters There is a good chance that he will get a brace.. He has Physical Therapy twice a week He left side doesn't work very well.. He is not yet eating by mouth and gets all his nutrition through his G-Tube. He is also quite a bit behind in speech (he gets speech therapy), but he seems to understand much more than he can say. He had a BAER test which was grossly abnormal for the left side so he has picked up a Audiologist. An ultra sound of his kidneys showed large amounts of calcium so he has also now picked up a kidney specialist. This most likely has to do with the massive amounts of lasix he received when he was having fluid retention problems. Hearing tests have shown that he is completely deaf in his left ear. Hearing in his right ear is normal. 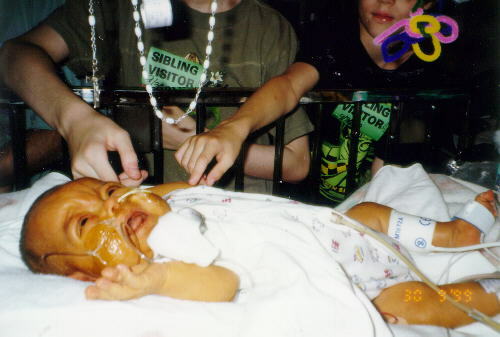 For all he has gone through he is a very happy little guy and really loves his four brothers and one sister. Aidan is going to have a brother. There is close to 100% chance that Aidan's little brother will neonatal hemochromatosis just like Aidan. We are going to name him Patrick Gabriel and call him 'Paddy'. Things have been very busy because we have discovered a new treatment that may help Paddy avoid a liver transplant. It involves a 4 hour IV treatment for Paddy's Mom (Willa) every week at the Fresno Hospital. And a meeting on a different day once a week with the perinatalogist (high risk pregnancy doctor). Aidan is not doing too well right now. His liver numbers are very elevated and there is no explanation why. He is on weekly or twice weekly blood draws along with visits with different medical specialists. The Fresno hospitals are an hour drive from home so Mom and Dad are spending a lot of time in the car. 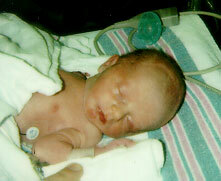 Patrick Gabriel Ryan was born on December 2nd, 2002. 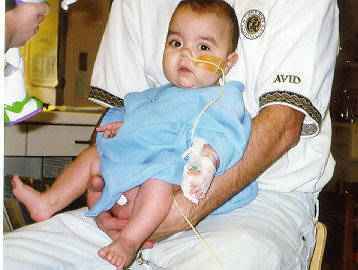 He was flown by helicopter from Fresno to San Francisco because he has the same liver problems that Aidan had. Mom and Dad drove over to San Francisco and stayed at Koret Family House. 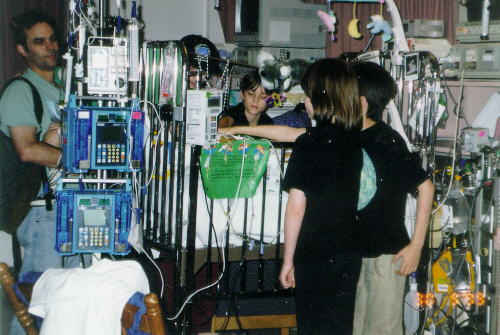 Paddy stayed in the NICU on the 15th floor at UCSF which is where Aidan stayed for a few months three years ago. When Paddy showed up at UCSF it looked like he may need a liver transplant, but the new IV treatment appears to have worked and each day Paddy got better and better. He was let out after a 3 week stay on December 24th and made it home for Christmas. Things have been somewhat crazy because Aidan has not been doing well (he is turning a shade of yellow now) and he was scheduled for a biopsy at the Children's Hospital in Fresno while Paddy was at UCSF. Dad (Kevin) was going to drive back to Fresno with Aidan for the biopsy and associated hospital stay, but the doctors decided to delay it. It was good to not have the two little guys both in different hospitals in different cities at the same time. Aidan's liver numbers have gotten better and his color has gotten better, but he has been having some fluid problems that may be related to his shunt and he has had to go back on supplemental oxygen. He looks much better than he did when he was yellow, but he is not very mobile and has taken to scooting himself around on his rear and doesn't walk much at all anymore. Aidan just got home from a 6 week stay in the hospital in San Francisco. It is likely that he will be going back sometime in the near future because his problems have not been resolved. They drained 5 lbs of fluid from his abdomen and his weight dropped from 32 lbs to 27 lbs. Aidan has been having some major problems. He has had a few seizures which are pretty scary and during the last one he stopped breathing on the ambulance ride with Dad down to Children's Hospital in Fresno. They wanted to send him by helicopter, but it was too stormy up in the mountains for the helicopter to come up and get him. His belly is very swollen with fluid problems and it is affecting his mobility and also his nutritional status. Aidan will be heading to UCSF in January for some possible brain surgery that will hopefully solve his current problems. Paddy is a very healthy and normal 1 year old. Aidan now has a caring bridge page. Click here to read more recent updates about Aidan. 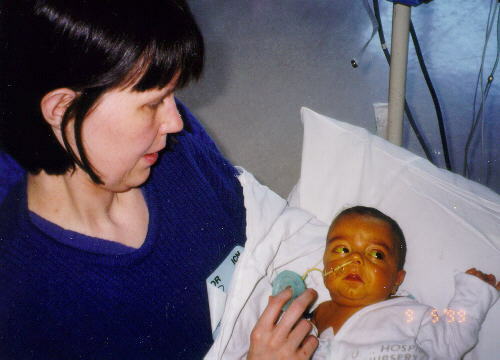 Aidan is now ten years old and approaching his 10 year transplant anniversity. Things have calmed down for him quite a bit. In two of his seizures he has stopped breathing, but he hasn't had any seizures recently. He still has moments where he scares us now and then, but life lately has mostly been good and calm for him. He likes to help his Dad in his home office by playing whatever game his Dad is working on. The caring bridge page listed above has some more detailed information about the brain surgeries that Aidan had to go through. Click here to send an email message to Aidan.